Ezra expect to raise $150million USD in this fund raising activity. If you are not sure whether you should subscribe the Rights or not, here are a few question to help you. Why the company is asking for new Funds? Do you know the purpose of the fund raising? Company using the additional money to build new business? or the Company is having a cashflow problem, and they are rising fund to pay old debt? Is the Industry doing well? If yes, the price of stock should be rising by now. If industry and stock both not doing well, why are you investing more money into this company? Conclusion: I think investor should buy stock like buying a business, the business that Make money for you is good Business, the business that keep losing money(price drop) for you is bad business. Always invest more on good business, Never add position to a losing position. 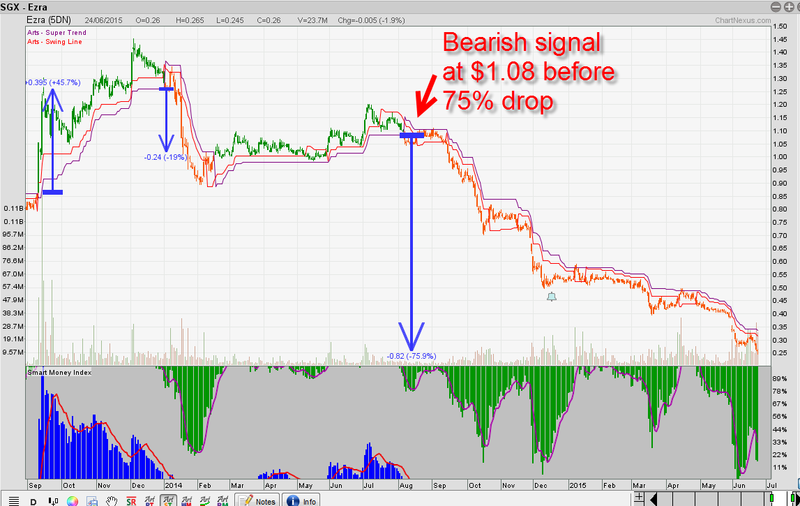 Below, our system show a bearish signal on ezra chart at $1.08, once again Proven to us that it can help us to prevent a big loss in stock!